This work originally came out of the Destination Oregon talk Mark gave at the Oregon Economic Forum back in the fall. We use this material regularly in our public talks and I was recently involved in conversations about the impact of these trends and wanted to make sure it was available on the blog as well. You have heard of the Rust Belt and likely of the Corn Belt, or the old Farm Belt. However you may not have heard of the Timber Belt. It comprises the swath of nonmetro areas from Northern California up through much of Oregon and Washington. This region of the country historically relied upon its natural resources (timber) and manufacturing (wood products and paper mills, e.g.) for its employment base. 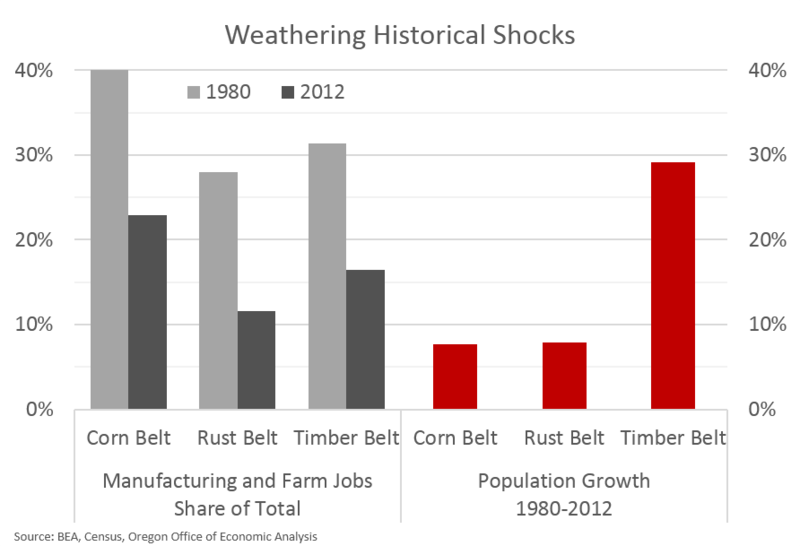 Like the Rust Belt and the Corn Belt, the Timber Belt suffered a tremendous negative economic shock starting in the 1980s. However, unlike the others, the Timber Belt has responded not by losing population in search of better economic opportunities. In the Timber Belt, people keep moving in. This is unique. It is also an advantage. In terms of the economic hit the Timber Belt experienced, it started with the early 1980s recession. At that time many of the mills in the region were at the end of their life cycle. The severe recession with sky high interest rates hurt the demand of new construction and wood products more broadly. As the recovery took hold, industry consolidation occurred and some mills retooled with new investment, however not all did. Furthermore, the wood products market had increased competition with lumber from British Columbia and U.S. southern pine. All told, the industry output recovered but not all the jobs returned. All of this was largely before the environmental restrictions which have seen the numbers fall significantly further. See here for more on the history of wood products in Oregon. Similar stories can be told of manufacturing industries across the country and particularly in the Rust Belt. Automation and technological change, coupled with globalization have reduced the demand of manufacturing labor, even as output continues to increase. In such locations the economy has generally, to borrow a phrase from Brad DeLong, rebalanced downward with population losses. Given the local economy was in bad shape, households relocated elsewhere in search of better opportunities. What makes Oregon and the Timber Belt unique in this regard is that people keep moving into the area. Such gains impact a whole host of data and different economic measures. Everything from labor force participation rates and demand for public services to per capita income and home prices. Not all is rosy or perfect, however there is something very positive to be said for thousands of individuals actively choosing to move to your state every year. Relative housing costs and employment opportunities do matter, particularly at different points in the business cycle, however in good times and bad, Americans are moving Oregon. And certainly not just to Portland and the state’s other major cities. Rural Oregon, like the nonmetro Timber Belt more broadly, sees the influx as well, particularly coastal, central, and/or southern counties in our state. What would be of interest to know is what demographic is moving into the Timberbelt. My hunch is it is primarily retirees and not families or adults in their working years. The latter I would think would have a greater positive impact on the local economy than retirees? Curious what you think.